A new study has revealed what many people over 35s have long realised – when it comes to working with them, even the Millennials (those aged 18-35) admit they can be – how do we say this? – a little work-shy. The study by YouGov polled residents in APAC countries (Australia included) and found that the stereotype about the Ys shirking it around the office could well be true. It found young people are four times more likely to describe their work ethic as lazy. 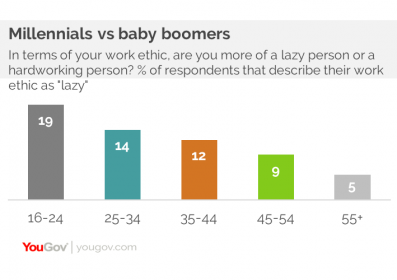 While a fifth (19 per cent) of 16-24 years admit to having a lazy work ethic, while only five per cent of those over 55 believe themselves to be lazy. According to the report, Australians (of all generations) are the most likely to see themselves as hardworking among all APAC respondents; with four-fifths of respondents (79 per cent) believe that they are hardworking in the workplace. When it came to physical labour, 70 per cent of Indonesians said they were lazy while women were more likely to see themselves as lazy, with 36 per cent of those polled seeing themselves as lazy (compared to just 27 per cent of men). Female respondents were also lazier when it came to how they choose to travel a distance of one kilometre. 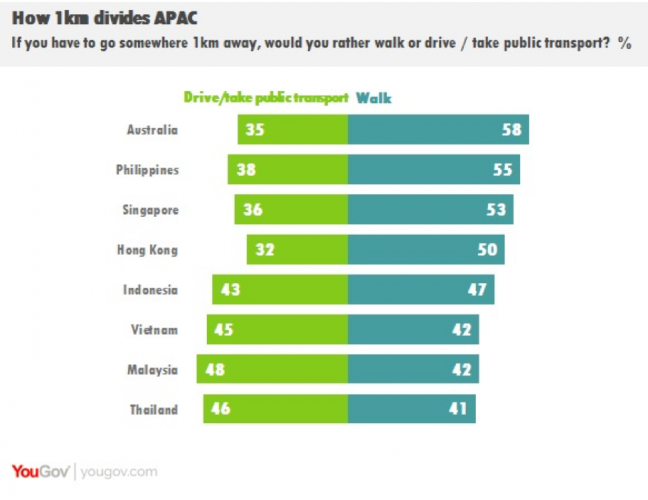 Asked whether respondents would rather walk or drive/take public transport to travel the distance, fewer than half of female respondents (44 per cent) would prefer to walk. This compares with 51 per cent of male respondents. YouGov also tested just how lazy workers were by probing the point at which people would opt to take the elevator over stairs. Although 92 per cent of respondents claim that they would opt for the stairs rather than an elevator to ascend by just one floor, nearly two-thirds of those polled (63 per cent) confess to having taken an elevator to do so in the past. Five floors is the cut-off point where most people would rather take the elevator stairs. More than four-fifths of the those polled (83 per cent) would opt for the elevator at this point, nearly double the number that would take the elevator to travel three floors (46 per cent).